Overview: The labor market reports were the only major economic data released over the past week, and they came in right on target. As a result, mortgage rates ended the week with little change. There were no surprises to be found in Friday’s important Employment Report. The economy gained 157,000 jobs in July, below the consensus forecast of 190,000. 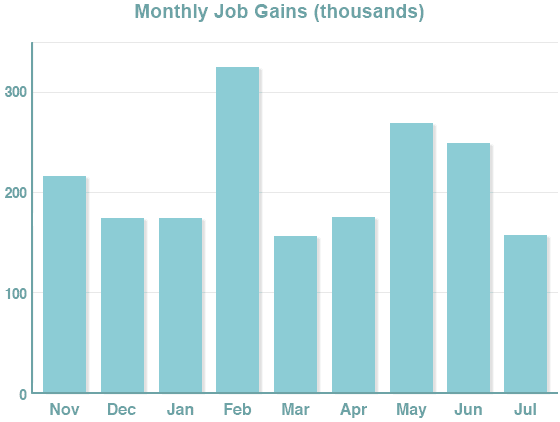 However, upward revisions added 59,000 jobs to the results for prior months, offsetting the shortfall. The economy has gained an average of 215,000 jobs per month so far this year, even higher than the strong pace of 184,000 seen over the same period last year. The unemployment rate decreased from 4.0% to 3.9%, as expected. Average hourly earnings, which is viewed as an indicator of wage growth, also matched expectations. They were 2.7% higher than a year ago, the same annual rate of increase as last month. The Job Openings and Labor Turnover Survey (JOLTS), which helps the Fed and investors round out their views of the strength of the labor market, revealed that there were 6.66 million job openings in June. This was close to the record high figure seen in April and exceeds the 6.56 million people who reported that they were looking for work that month. A high level of workers also willingly left their jobs. This is viewed as a sign of labor market strength, since people usually quit only if they believe they can find better jobs. Looking ahead, the Consumer Price Index (CPI) will come out on Friday. CPI is a widely followed monthly inflation report that looks at the price change for goods and services. The Retail Sales report will be released on August 15. Consumer spending accounts for about 70% of all economic activity in the U.S., and the retail sales data is a key indicator of growth. The Industrial Production and Capacity Utilization report, another important indicator of economic growth, will also come out on August 15.